Sense-making | We see the world not as it is, but as we are. So people ask about Safety Differently ‘How do I do this.’ But what they really want an answer to is the question ‘What do I do now?’ What they really want is someone to tell them, because they haven’t taken the time to think it through, to study the ideas further, to show curiosity and discover the difficulties and adaptive triumphs of frontline work for themselves. They just want other people to tell them what to do. That is literally taking a Safety I mindset to a Safety II world. Of course, the ‘how’-to-get-to-Safety-Differently question is increasingly getting answered in the expanding menu of method options—from embedded discovery to micro-experiments, collective improvements, appreciative inquiry and more. But not the ‘what’ question. To help people flip the switch, I sometimes will use cooking as an analogy. I’ll ask: Do you want to be a Recipe Follower or a Chef? Recipes are written to be easily repeated. Anyone can follow. Practice and expertise increase success. And you get a standardized result. There are lots of recipes in Safety-I. What happens though if you don’t have all the recipe ingredients at hand? Or someone above demands you must cut the baking time in half? As a Recipe Follower you would be confused, stymied, even paralyzed. A Chef, however, would accept the challenge and adapt to the unexpected conditions. A Chef doesn’t follow a cookbook but knows the art and principles of cooking. 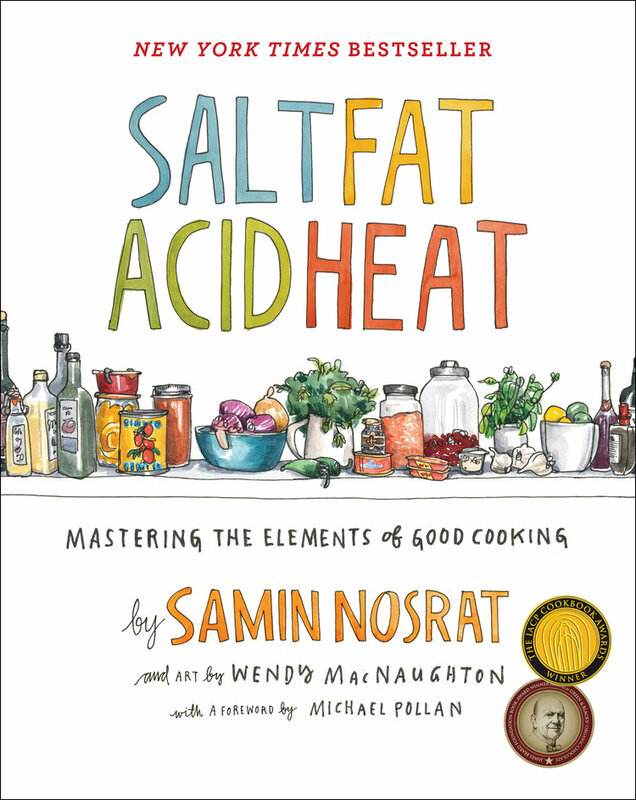 Samin Nosrat in “Salt Fat, Acid, Heat” explains how salt enhances flavour, fat amplifies flavour and makes appealing textures possible, acid brightens and balances, and heat determines the texture of food. Today I had the privilege and pleasure of speaking at the BCCGA AGM. A copy of the slides presented can be downloaded here. In my conclusion I posed 4 questions for the BCCGA and its member organizations to consider. 1. What paradigm(s) should our safety vision be based upon? 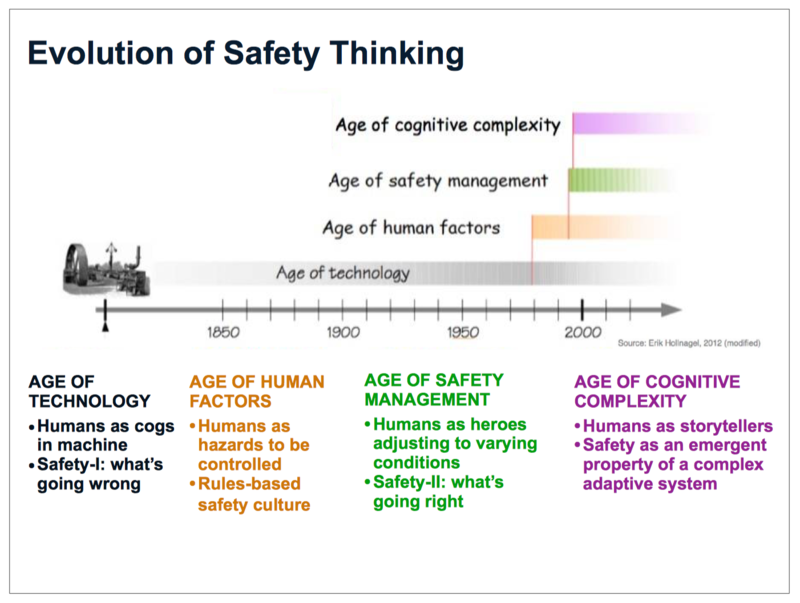 The evolution of safety thinking can be viewed through 4 Ages. The recurring theme is about how Humans were treated as new technologies were implemented into business practices. It’s logical that the changes in safety thinking mirror the evolution of Business Practices. The Ages of Technology, Human Factors, and Safety Management are rooted in an Engineering paradigm. It’s Systems Thinking with distinct parts: People, Process, Technology. Treat them separately and then put them together to deliver a Strategy. Reductionism works well when the system is stable, consistent, and relatively fixed by constraints imposed by humans (e.g., regulations, policies, standards, rules). However, in addition to ORDER, there are 2 other systems: COMPLEX and CHAOTIC in the real world. These two are constantly changing so a reductionistic approach is not appropriate. One must work holistically with an Ecological paradigm. This diagram from the Cynefin Centre shows the relative sizing of the 3 systems. Complexity by far is the largest and continues to grow. All organizations are complex adaptive system. A worthy safety vision must include the Age of Cognitive Complexity and view Safety as an emergent property of a complex adaptive system. The different thinking means rules don’t create safety but create the conditions that enable safety to emerge. Now we can understand why piling on more and more rules can lead to cognitive overload in workers and enable danger, not safety, to emerge. 2. How should we treat workers – as problems to be managed or solutions to be harnessed? The Age of Technology and Age of Human Factors treated workers as problems – as cogs in a machine and as hazards to be controlled. The Age of Safety Management view recognizes that rules cannot cover every situation. Variability isn’t a threat but a necessity. We need to trust that humans always try to do what they think is right in the situation. The Age of Cognitive Complexity appreciates that humans think differently than logical information-processing machines in an Engineering paradigm. Humans are not rational thinkers; decisions are based on emotional reactions & heuristic shortcuts. As storytellers, people can articulate thick data that a typical report is unable to provide. As solution providers, workers can call upon tacit knowledge – difficult to transfer to another person by means of writing it down or verbalizing it. Workers who feel like cogs or hazards tend to stay within themselves for fear of punishment. Knowledge is volunteered; never conscripted. 3. What safety heuristics can we share? While Best Practices manuals are beneficial, heuristics are on a bigger stage when dealing with decisions. Humans make 95% of their decisions using heuristics. Heuristics are mental shortcuts to help people make quick, satisfactory but not perfect decisions. They are the rules of thumb that Masters pass on to their Apprentices. Organizations ought to have a means to collect Safety-II success stories and use pattern recognition tools. Heuristics that emerge can be distributed to Masters for accuracy scrutiny. 4. How can we get more safety stories like these, fewer stories like those? Each dot is a story and seen together they form patterns. The map shows the general direction we want to head – top right corner (High compliance with rules & High level of getting the job done). Clearly we want more safety stories in the Green area. We also want fewer in the Red and Brown areas. Here’s the rub: If we try to go directly for the top right corner, we won’t get there. This is ATTITUDE mapping at a level way deeper than observable BEHAVIOUR. Instead we head for an Adjacent Possible. We get people to tell more stories here, fewer there by changing a human constraint. It might be loosening a controlling constraint like a rule or practice. It could also be introducing an enabling constraint like a new tool or process. We gather more stories and monitor how the clusters are changing in real-time. The evolving landscape maps a new Present state – a new starting point. We then change another constraint. Since we can’t predict outcomes both positive and unintended negative consequences might emerge. We accelerate the positives and dampen the negatives. In essence we co-evolve our way to the top right corner of the map. This is how we shape our Safety Culture. One of my favourite articles is The Complexity of Failure written by Sidney Dekker, Paul Cilliers, and Jan-Hendrik Hofmeyr. In this posting I’d like to shed more light on the contributions of Paul Cillliers. Professor Cilliers was a pioneering thinker on complexity working across both the humanities and the sciences. In 1998 he published Complexity and Postmodernism: Understanding Complex Systems which offered implications of complexity theory for our understanding of biological and social systems. Sadly he suddenly passed away in 2011 at the much too early age of 55 due to a massive brain hemorrhage. My spark for writing comes from a blog recently penned by a complexity colleague Sonja Bilgnaut. I am following her spade work by exploring the implications of complexity for safety. Cilliers’ original text is in italics. Because humans are natural storytellers, stories are a widely used interaction between fellow workers, supervisors, management, and executives. We need to pay attention to stories told about daily experiences since they provide a strong signal of the present safety culture. We should devote less time trying to change people and their behaviour and more time building relationships. Despite what psychometric profiling offers, humans are too emotional and unpredictable to accurately figure out. In my case, I am not a trained psychologist so my dabbling trying to change how people tick might be dangerous, on the edge of practising pseudoscience. I prefer to stay with the natural sciences (viz., physics, biology), the understanding of phenomena in Nature which have evolved over thousands of years. If two workers are in conflict, don’t demand that they both smarten up. Instead, change the nature of relationship so that their interactions are different or even extinguished. Simple examples are changing the task or moving one to another crew. Interactions go beyond people. Non-human agents include machines, ideas (rules, policies, regs) and events (meeting, incident). A worker following a safety rule can create a condition to enable safety to emerge. Too many safety rules can overwhelm and frustrate a worker enabling danger to emerge. 2. Complex organizations are open systems. This means that a great deal of energy and information flows through them, and that a stable state is not desirable. A company’s safety management system (SMS) is a closed system. In the idealistic SMS world, stability, certainty, and predictability are the norms. If a deviation occurs, it needs to be controlled and managed. Within the fixed boundaries, we apply reductionistic thinking and place information into a number of safety categories, typically ranging from 4 to 10. An organizational metaphor is sorting solid LEGO bricks under different labels. In an open system, it’s different. Think of boundary-less fog and irreducible mayonnaise. If you outsource to a contractor or partner with an external supplier, how open is your SMS? Will you insist on their compliance or draw borders between firms? Do their SMS safety categories blend with yours? All organisations are complex adaptive systems. Adaptation means not lagging behind and plunging into chaotic fire-fighting. It means looking ahead and not only trying to avoid things going wrong, but also trying to ensure that they go right. In the field, workers when confronted by unexpected varying conditions will adjust/adapt their performance to enable success (and safety) to emerge. When field adjustments occasionally fail, it results in a new learning to be shared as a story. This is also why a stable state is not desirable. In a stable state, very little learning is necessary. You just repeat doing what you know. 3. Being open more importantly also means that the boundaries of the organization are not clearly defined. Statements of “mission” and “vision” are often attempts to define the borders, and may work to the detriment of the organization if taken too literally. A vital organization interacts with the environment and other organizations. This may (or may not) lead to big changes in the way the organization understands itself. In short, no organization can be understood independently of its context. Mission and Vision statements are helpful in setting direction. A vector, North Arrow, if you like. They become detrimental if communicated as some idealistic future end state the organization must achieve. Being open is different than “thinking out of the box” because there really is no box to start with. It’s a contextual connection of relationships with other organizations. It’s also a foggy because some organizations are hidden. You can impact organizations that you don’t even know about and conversely, their unbeknownst actions can constrain you. The smart play is to be mindful by staying focused on the Present and monitor desirable and undesirable outcomes as they emerge. 4. Along with the context, the history of an organization co-determines its nature. Two similar-looking organizations with different histories are not the same. Such histories do not consist of the recounting of a number of specific, significant events. The history of an organization is contained in all the individual little interactions that take place all the time, distributed throughout the system. Don’t think about creating a new safety mission or vision by starting with a blank page, a clean sheet, a greenfield. The organization has history that cannot be erased. The Past should be honoured, not forgotten. Conduct an ongoing challenge of best practices and Life-saving rules. Remember the historical reasons why these were first installed. Then question if these reasons remain valid. Be aware of the part History plays when rolling out a safety initiative across an organization. If it’s something that everyone genuinely agrees to and wants, then just clone & replicate. Aggregation is the corollary of reductionism and it is the common approach to both scaling and integration. Liken it to putting things into org boxes and then fitting them together like a jigsaw. The whole is equal to the sum of its parts. But what if the initiative is controversial? Concerns are voiced, pushback is felt, resistance is real. Then we’re facing complexity where the properties of the safety system as a whole is not the sum of the parts but are unique to the system as a whole. The change method is not to clone & replicate. Start by honouring local context. Then decompose into stories to make sense of the culture. Discover what attracts people to do what they do. Recombine to create a mutually coherent solution. 5. Unpredictable and novel characteristics may emerge from an organization. These may or may not be desirable, but they are not by definition an indication of malfunctioning. For example, a totally unexpected loss of interest in a well-established product may emerge. Management may not understand what caused it, but it should not be surprising that such things are possible. Novel features can, on the other hand, be extremely beneficial. They should not be suppressed because they were not anticipated. In the world of safety, failures are unpredictable and undesirable. They emerge when a hidden tipping point is reached. As part of an Emergency Preparedness plan, recovery crews with well-defined roles are designated. Their job is to fix the system as quickly as possible and safely restore it to its previous stable state. Serendipity is an unintended but highly desirable consequence. This implies an organization should have an Opportunity crew ready to activate. Their job is to explore the safety opportunity, discover new patterns which may lead to a new solution, and exploit their benefits. At a tactical level, the new solution may be a better way of achieving the Mission and Vision. In the same direction but a different path or route. At a strategic level, the huge implication is that new opportunity may lead to a better future state than the existing carefully crafted, well-intentioned one. Decision-makers are faced with a dilemma: do we stay the course or will we adapt and change our vector? Avoid introducing novel safety initiatives as big events kicked off with a major announcement. These tend to breed cynicism especially if the company history includes past blemished efforts. Novelty means you honestly don’t know what the outcomes will be since it will be a new experience to those you know (identified stakeholders) and those you don’t know in the foggy network. Launch as a small experiment. If desirable consequences are observed, accelerate the impact by widening the scope. If unintended negative consequences emerge, quickly dampen the impact or even shut it down. As noted in (2), constructively de-stabilize the system in order to learn. 6. Because of the nonlinearity of the interactions, small causes can have large effects. The reverse is, of course, also true. The point is that the magnitude of the outcome is not only determined by the size of the cause, but also by the context and by the history of the system. This is another way of saying that we should be prepared for the unexpected. It also implies that we have to be very careful. Something we may think to be insignificant (a casual remark, a joke, a tone of voice) may change everything. Conversely, the grand five-year plan, the result of huge effort, may retrospectively turn out to be meaningless. This is not an argument against proper planning; we have to plan. The point is just that we cannot predict the outcome of a certain cause with absolute clarity. The Butterfly effect is a phenomenon of a complex adaptive system. I’m sure many blog writers like myself are hoping that our safetydifferently cause will go viral, “cross the chasm”, and be adopted by the majority. Sonja in her blog refers to a small rudder that determines the direction of even the largest ship. Perhaps that’s what we are: trimtabs! On the negative side, think of a time when an elected official or CEO made a casual remark about a safety disaster only to have it go viral and backfire. In 2010 Deep Horizon disaster then CEO Tony Hayward called the amount of oil and dispersant “relatively tiny” in comparison with the “very big ocean”. Hayward’s involvement has left him a highly controversial public figure. Question: Could a long-term safety plan to progress through the linear stages of a Safety Culture Maturity model be a candidate as a meaningless five-year plan? If a company conducts an employee early retirement or buy-out program, does it regress and fall down a stage or two? If a company deploys external contractors with high turnover, does it ever get off the bottom rung? Instead of a linear progression model, stay in the Present and listen to the stories internal and external workers are telling. With the safety Vision in mind, ask what can we do to hear more stories like these, fewer stories like those. As the stories change, so will the safety culture. Proper planning is launching small experiments to shape the culture. 7. Complex organizations cannot thrive when there is too much central control. This certainly does not imply that there should be no control, but rather that control should be distributed throughout the system. One should not go overboard with the notions of self-organization and distributed control. This can be an excuse not to accept the responsibility for decisions when firm decisions are demanded by the context. A good example here is the fact that managers are often keen to “distribute” the responsibility when there are unpopular decisions to be made—like retrenchments—but keen to centralize decisions when they are popular. I’ve noticed safety professionals are frequent candidates for organization pendulum swings. One day you’re in Corporate Safety. Then an accident occurs and in the ensuing investigation a recommendation is made to move you into the field to be closer to the action. Later a new Director of Safety is appointed and she chooses to centralize Safety. Pendulum swings are what Robert Fritz calls Corporate Tides, the natural ebb and flow of org structure evolution. Central v distributed control changes are more about governance/audit rather than workflow purposes. No matter what control mechanism is in vogue, it should enable stigmergic behaviour, the natural forming of network clusters to share knowledge, processes, and practices. In a complex adaptive system, each worker is an autonomous decision-maker, a solution not a problem. Decisions made are based on information at hand (aka tacit knowledge) and if not available, knowing who, where, how to access it. Every worker has a knowledge cluster in the network. A safety professional positioned in the field can mean quicker access but more importantly, stronger in-person interactions. This doesn’t discount a person in Head Office who has a trusting relationship from being a “go to” guy. Today’s video conferencing tools can place the Corp Safety person virtually on site in a matter of minutes. Note: If you have any comments, I would appreciate if you would post them at safetydifferently.com. My thanks to Peter Caulfield for interviewing me and writing an article in the Journal of Commerce on a different view of safety. Veteran Vancouver engineer and consultant Gary Wong says the safety industry needs to reexamine its goals and how to accomplish them if it wants to keep workers safe and at the same time make them productive. Wong’s approach, called Safety Differently, is based on what he says is a more realistic take on what goes on in the workplace. That approach, says Wong, is based on the belief that humans must be controlled with compliance rules and procedures. Safety Differently on the other hand credits workers for getting things right, which he says they do most of the time. When facing an unexpected change, people will adjust their actions accordingly, he says. In most cases, their adjustment will keep them stay safe. But an unexpected change can also be dangerous, and, if a tipping point is reached, an incident can happen. “Safety Differently focuses on hidden non-linear tipping point signals and how humans sense impending danger,” Wong says. Ron Gantt, vice-president of SCM Safety Inc. in San Ramon, Calif., says there is a big difference between Safety Differently and the old way of doing safety. Safety Differently is based on three principles, Gantt says. “First, it is a forward-looking, predictive tool,” he says. Safety Differently’s second operating principle is that people are the solution, not the problem. Third, the people at the top of an organization should view safety as an ethical responsibility. “They need to be curious about what their employees want and make an effort to satisfy them,” Gantt says. Safety Differently is needed, he says, because the world is becoming more interdependent and complex and small changes can have huge effects. Support for Safety Differently is growing, he adds. “Many safety professionals are frustrated with the old way of doing things,” Gantt says. At the same time, there is resistance from people and groups with a vested interest in maintaining the status quo. “They are likely to say that the way to reduce the number of workplace injuries and deaths is to keep things the old way but to try harder,” he says. Erik Hollnagel, a Danish academic and expert in system safety and human reliability analysis, advocates the application of “synesis to safety.” The term means the same thing as synthesis, or bringing together. “The effort to ensure that work goes well and that the number of acceptable outcomes is as high as possible requires a unification of priorities, perspectives and practices,” says Hollnagel. Many sectors of the economy conflate safety and quality or safety and productivity, Hollnagel says. “We can look at a process or work situation from a safety point of view, from a quality point of view or from a productivity point of view,” Hollnagel says. Imagine you work in a company with a good safety record. By “good”, you are in the upper quartile as per the benchmarking stats in your industry. Things were rolling along nicely until this past year. There was a steep increase in failures which has led to concerns over the safety culture. Historically there have 2 safety-related events but last year there were 10. Accident investigation reports show it’s not one category but several: Bodily reaction and exertion, Contact with equipment, Misuse of hazardous materials, Falls and falling objects. Fortunately there were no fatalities; most were classified as medical aids but one resulted in a serious injury. Three medical aid injuries were from contacting moving equipment, two were related to improper tool and glove use. The serious injury was due to a worker falling off a ladder. What upsets you is that the pre-job briefing did not identify the correct glove or the proper use of hazardous materials. You also read the near-miss incidents and heard disturbing rumours from the grapevine that a some recent close calls went unreported. Something needs to be done but what should you do? One option is to do a safety audit. It will be highly visible and show executives and workers you mean business. Phase 1 will consist of conducting an assessment and developing action plans to close any performance gaps. The gaps typically concentrate on strengthening safety robustness – how well practices follow safety policies, systems, standards, regulations, rules to avoid known failures. Phase 2 will implement the action plans to ensure that actions are being completed with quality and in a timely manner. A survey will gauge worker response. The safety audit project will end with a report that details the completion of the actions and observations on how the organization has responded to the implementation of the plan. For optics reasons, you are considering hiring an external consultant with safety expertise. This expert ideally would know what to look for and through interviews and field observations pinpoint root causes. Action plans will be formulated to close the gaps. If done carefully, no blame will be attached anybody. To ensure no one or group is singled out, any subsequent compliance training and testing will be given to all employees. Assuming all goes well, you can turn the page, close the chapter, and march on assuming all is well. Or is it? What if the external safety consultants are trapped by their expertise because they already believe they have the solution and see the job as implementing their solution and making it work? That is, what if they are great at using a hammer and therefore see everything as a nail, including a screw? What if the safety audit is built around a position that is the consultant’s ideal future state but not ours? What if the survey questionnaire is designed to validate what the safety consultants have seen in the past? What if front-line workers are reluctant to answer questions during interviews for feelings of being put on trial, fear of being blamed, or worse, subjects in a perceived witch hunt? What if safety personnel, supervisors, managers, executives are reluctant to answer questions during interviews or complete survey questionnaires for the fear of being held accountable for failures under their watch? What if employees feel it’s very unsettling to have someone looking their shoulders recording field observations? What if the union complains because it’s deemed a regression to the Scientific Management era (viz., Charlie Chaplin’s movie ‘Modern Times’)? What if the performance gaps identified are measured against Safety Management System (SMS) outcomes that are difficult to quantify (e.g., All personnel must report near-miss incidents at all times)? What if we develop an action plan and during implementation realize the assumptions made about the future are wrong? What if during implementation a better solution emerges than the one recommended? What if the expenditure on a safety audit just reinforces what we know and nothing new is learned? Are there other options besides a traditional safety audit? Yes, there is. And it’s different. A sense-making approach boosts the capacity of people and organizations to handle their activities successfully, under varying conditions. It recognizes the real world is replete with safety paradoxes and dilemmas that workers must struggle with on a daily basis. The proven methods are pragmatic and make sense of complexity in safety in order to act. The stories gathered from the workforce including contractors often go beyond safety robustness (preventing failure) and provide insights into the company’s level of safety resilience. Resilience is the ability to quickly recover after a failure, speedily implement an unanticipated opportunity arising from an event, and respond early to an alert that a major catastrophe might be looming over the horizon. The paradigm is not as an expert with deep knowledge of best practices in safety but as an anthropologist informed by the historical evolution of safety practices. The Santa Fe Institute noted companies operate in industries which are complex adaptive systems (CAS). Safety is not a product nor a service; it is an emergent property of a complex adaptive system. For instance, safety rules enable safety to emerge but too many rules can overwhelm workers and create confusion. If a tipping point is reached, danger emerges in the form of workers doing workarounds or deliberately ignoring rules to get work done. Anthropologists believe culture answers can best be found by engaging the total workforce. The sense-making consultant’s role is to understand the decisions people have made. Elevating behaviour similarities and differences can highlight what forces are at play that influence people to choose to stay within compliance boundaries or take calculated risks. By applying complexity-based thinking, here’s how the what-if concerns listed above are addressed. There are no preconceived notions or solutions. As ethnographers, observations that describe the safety culture are recorded. Stories are easy to capture since people are born storytellers. Stories add context, can describe complex situations, and emotionally engage humans. You can only act to change the Present. Therefore, attention is placed on the current situation and not some ideal future state that may or may not materialize. Stay clear of cognitive dissonance. This leads to the confirmation bias — the often unconscious act of referencing only those perspectives that fuel pre-existing views. There are no survey questionnaires. Questions asked are simple prompts to help workers get started in sharing their stories. Stories are very effective in capturing decisions people must make dealing with unexpected varying conditions such as conflicting safety rules, lack of proper equipment, tension amongst safety, productivity, and legal compliance. Front-line workers are not required to answer audit questions. They have the trust and freedom to tell any story they wish. It’s what matters most to them, not what a safety expert thinks is important and needs to interrogate. Safety personnel, supervisors, managers, executives also get to tell their stories. Their behaviours and interactions play a huge role in shaping the safety culture. There is no “Them versus Us”; it’s anyone and everyone in the CAS. Make it easy and comfortable. There is minimal uneasiness with recording field observations since workers choose the topics. A story with video might be showing what goes wrong or what goes right. If union agents are present, they are welcomed to tell their safety stories and add diversity to the narrative mosaic. Be guided by the compass, not the clock. Performance improvement is achieved by focusing on direction, not targeted SMS outcomes. This avoids the dilemma of workers through their stories identifying SMS as a problem. Direction comes from asking: “Where do we want fewer stories like these and more stories like that?” The effectiveness of an performance improvement intervention is measured by the shift in subsequent stories told. Avoid the time and effort developing a robust fail-safe action plan and then weakening it with CYA assumptions. When dealing with uncertainty and ambiguity, probe the CAS with safe-to-fail experiments. This is the essence behind Nudge theory, introducing small interventions to influence behaviour changes. Think of navigating a ship on a uncontrollable sea of complexity from driving a train on a controllable track of certainty. Deviation manoeuvres like tacking and jibing are expected. By designing actions to be small, emergence of surprising consequences can be better handled. Positive serendipitous opportunities heading in the desired direction can be immediately seized. On the other hand, negative consequences are quickly dampened. Focus on what you don’t know. A sense-making approach opens the individual’s and thus the company’s mindset to Knowledge (known knowns) as well as Ignorance (unknowns, unknowables). New learning comes from exploring Ignorance. By sensing different behaviour patterns that emerge from the nudges, it becomes clearer why people behave the way they do. This discovery may lead to new ways to strengthen safety robustness + build safety resilience. This is managing the evolutionary potential of the Present, one small step at a time. If you’re tired of doing same old, same old, then it’s time to conduct an “audit” on your safety audit approach and choose to do safety differently. Click here for more thoughts on safety audits. During engineering school in the late 1960s I was taught to ignore friction as a force and use first order approximate linear models. When measuring distance, ignore the curvature of earth and treat as a straight line. Break things down into its parts, analyze each component, fix it, and then put it all back together. In the 1990s another paradigm coined Systems Thinking came about we jumped from Taylorism to embrace the Fifth Discipline, social-technical systems, Business Process Reengineering. When human issues arose, we bolted on Change Management to support huge advances in information technology. All industries have benefited and been disrupted by business and technological breakthroughs. Safety as an industry is no exception. Let’s be clear. I’m not advocating abandoning safety rules, regulations, hierarchy of controls, checklists, etc. and letting workers go wild. We just need to treat them as boundaries and constraints that either enable or prevent safety as a CAS property from emerging. By repurposing them in our mind, we can better see why rules prevent danger from emerging and why too many constraining rules might create the conditions for danger such as confusion, distraction, anger to emerge. As overloading increases, a tipping point is reached, the apex of a non-linear parabola curve. A phase transition occurs and a surprise emerges, typically the failure of a brittle agent. 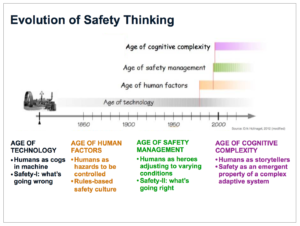 As the eras of business have evolved from scientific management to systems thinking, so has safety in parallel. The graphic below is a modification of an Erik Hollnagel slide presented at the 2012 Resilience Learning Lab in Vancouver and extends beyond to an Age of Cognitive Complexity. In this age of cognitive complexity, the whole is greater than the sum of its parts (aka agents). “Different is more” which means the greater the diversity of agents, the greater the distributed cognition. Think wisdom of crowds, crowdfunding, crowdsourcing. “More is different” which means when you put the pieces of a complex system together you get behavior that is only understandable and explainable by understanding how the pieces work in concert (see Ron Gantt’s enlightening posting). In a CAS, doing the same thing over and over again can lead a different result. ”Different is order within unorder” which means in a complex environment full of confusion and unpredictability, order can be found in the form of hidden patterns. Think of a meeting agenda that shapes the orderly flow of discussion and contributions of individuals in a meeting. In nature, think of fractals that can be found everywhere. When working in a Newtonian-Cartesian linear system, you can craft an idealistic Future state and develop a safety plan to get there. However, in a CAS, predicting the future is essentially a waste of time. The key is to make sense of the current conditions and focus on the evolutionary potential of the Present. 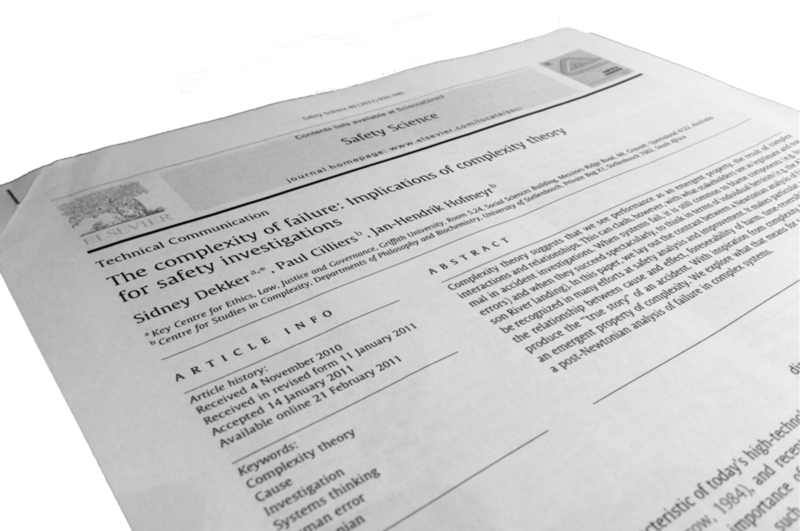 Is the shift to complexity-based safety thinking sufficient to warrant a new label? Dare we call this different paradigm Safety-III? It can be a container for the application of cognition and complexity concepts and language to safety: Adaptive safety, Abductive safety reasoning, Exaptive safety innovation, Viral safety communication to build trust, Autopoietic SMS, Dialogic safety investigation, Heuristics in safety assessment, Self-organizing role-based crew structures, Strange attractors as safety values, Cognitive activation using sensemaking safety rituals, Feedback loops in safety best practices, Brittleness in life saving rules, Swarm intelligent emergency response, Human sensor networks, Narrative safe-to-fail experiments, Attitude real-time monitoring as a safety lead indicator, Cynefin safety dynamics. Over time I’d like to open up an exploratory dialogue on some of these on the safetydifferently.com website. ‘Investigations that embrace complexity, then, might stop looking for the ‘‘causes’’ of failure or success. Instead, they gather multiple narratives from different perspectives inside of the complex system, which give partially overlapping and partially contradictory accounts of how emergent outcomes come about. By taking complexity theory ideas like the butterfly effect, unruly technology, tipping points, diversity, we can understand that failure emerges opportunistically, non-randomly, from the very webs of relationships that breed success and that are supposed to protect organizations from disaster. When there is an absence of an adverse outcome, it becomes a non-event which people take for granted. When people see nothing, they presume that nothing is happening and that nothing will continue to happen if they continue to act as before. Safety-III is observing, measuring, maybe managing but definitely influencing changes in the conditions that enables safety to happen in a CAS. In addition, it’s active engagement in observing, measuring, maybe managing but definitely influencing changes in the complex conditions that prevent danger from emerging. I suggest that different skill set will be based on a complexity-based safety approach. Four essential abilities that a system or an organisation must have: Respond, Anticipate, Monitor, Learn. Below is how I see the fit with complexity principles. We respond by focusing on the Present. Typically it’s an action to quickly recover from a failure. However, it can also be seizing opportunity that serendipitously emerged. Carpe Diem. Because you can’t predict the future in a CAS, having a ready-made set of emergency responses won’t help if unknowable and unimaginable Black Swans occur. Heuristics and complex swarming strategies are required to cope with the actual. We anticipate by raising our awareness of potential tipping points. We don’t predict the future but practice spotting weak signals of emerging trends as early as we can. Our acute alertness may sense we’re in the zone of complacency and need to pull back the operating point. We learn by making sense of the present and adapting to co-evolve the system. We call out Safety-I myths and fallacies proved to be in error by facts based on complexity science. We realize the importance of praxis (co-evolving theory with practice). We monitor the emergence of safety or danger as adjustments are made to varying conditions. We monitor the margins of maneuver and whether “cast in stone” routines and habits are building resilience or increasing brittleness. What publications am I missing that support or argue against a complexity-based safety approach? Will calling it Safety-III help to highlight the change or risk it being quickly dismissed as a safety fad? I am now contributing safety thoughts and ideas on safetydifferently.com. Here is a reprint of my initial posting. If you wish to add a comment, I suggest you first read the other comments at safetydifferently.com and then includes yours at the end to join the conversation. This seemingly paradoxical statement was penned by Annie Dillard. She isn’t a safety professional nor a line manager steeped in safety experiences. Annie is a writer who in her book The Writing Life became fascinated by a stunt pilot, Dave Rahm. When Rahm wasn’t entertaining the audience on the ground, he was entertaining students as a geology professor at Western Washington State College. His fame to “do it right “ in aerobatics led to King Hussein recruiting him to teach the art and science to the Royal Jordanian stunt flying team. While in Jordan performing a maneuver, Rahm in his plane plummeted to the ground and burst into flames. The royal family and Rahm’s wife and son were watching. Dave Rahm was instantly killed. After years and years of doing it right, something went wrong for Dave Rahm. How could have this happen? How can danger be the safest thing? Let’s turn our attention towards Resilience Engineering and the concept of Emergent Systems. By viewing Safety as an emergent property of a complex adaptive system, Dillard’s statement begins to make sense. Clearly a stunt pilots pushes the envelope by taking calculated risks. He gets the job done which is to thrill the audience below. Rahm’s maneuver called “headache” was startling as the plane stalled and spun towards earth seemingly out of control. He then adjusted his performance to varying conditions to bring the plane safely under control. He wasn’t pre-occupied with what to avoid and what not to do. He knew in his mind what was the right thing to do. 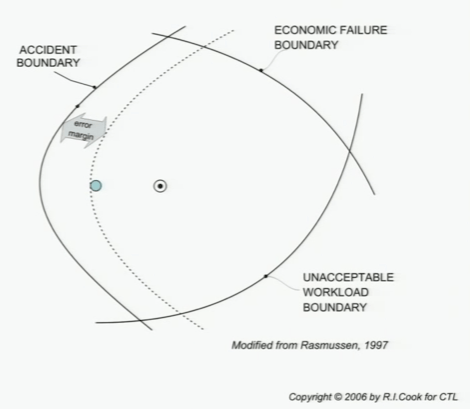 We can apply Richard Cook’s modified Rasmussen diagram to characterize this deliberate moving the operating point towards failure but taking action to pull back from the edge of failure. As the op point moves closer to failure, conditions change enabling danger as a system property to emerge. To Annie Dillard this aggressive head into, pulling back action was how Danger was the safest thing in the world if you went about it right. The job was to thrill people with acts that appeared dangerous. And show after show Dave Rahm pleased the crowd and got the job done. However, on his fatal ride, Rahm and his plane somehow reached a non-linear complexity phenomenon called the tipping point, a point of no return, and sadly paid the final price. Have you encountered workers who behave like stunt pilots? A stunt pilot will take risks and fly as close to the edge as possible. If you were responsible for their safety or a consultant asked to make recommendations, what would you do? Would you issue a “cease and desist” safety bulletin? Add a new “safety first…”rule to remove any glimmers of workplace creativity? Order more compliance checking and inspections? Offer whistle-blowing protection? Punish stunt pilots? On the other hand, you could appreciate a worker’s willingness to take risks, to adjust performance when faced with unexpected variations in everyday work. You could treat a completed task as a learning experience and encourage the worker to share her story. By showing Richard Cook’s video you could make stunt pilots very aware of the complacency zone and over time, how one can drift into failure. This could lead to an engaging conversation about at-risk vs. reckless behaviour. How would you deal with workers who act as stunt pilots? Command & control? Educate & empower? Would you do either/or? Or do both/and?